Hunter has learnt many skills with the help of our behaviour team, and is now ready to show them off in a new home. With his sharp mind and eagerness to learn, there’s no limit to what Hunter can achieve. The happy hound has come a long way under the care of our behaviour team. He’s ready to take all his skills into a loving home where he can show off just how clever he is. “When we first met Hunter, he was having trouble with generalised anxiety, impulse control and handling,” said Liam, behaviour trainer at the Home. Hunter has spent many weeks with our behaviour team. 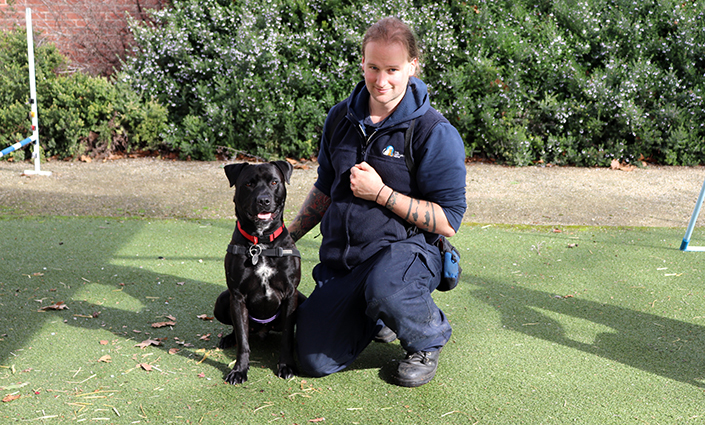 Through positive reinforcement training, his confidence has grown and he has learnt a range of skills to set him up for success in a new home. “We’ve been doing lots of positive, food-based training. Hunter is an absolute guts, so he’ll do anything for a treat,” said Liam. “We have conditioned him to a clicker, with a click meaning he has demonstrated a positive behaviour and a reward will follow. Hunter was a little hesitant with handling. We’ve done some counter-conditioning, teaching him that handling is a positive experience. He’s quite happy to relax into a pat now. “Hunter can go to his mat, drop on it and will wait to get up off it. He can target (touch his nose to your hand, which can be useful in guiding him around), sit, drop, shake and roll over. He has also been out in the agility yard a fair bit and will walk across the balancing equipment when asked. This fun-loving goofball will bring a lot of energy and enjoyment into his new home. “Hunter is a sensitive soul looking for a calm and confident owner who will stick to positive methods of training,” said Liam. Hunter (ID 1029511) is up for adoption at our North Melbourne shelter. 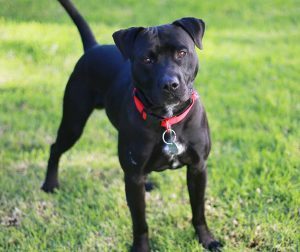 If he sounds like the perfect pet for you, our behaviour team would love to hear from you on (03) 9329 2755.